3 :: Gerrards Cross Golf Club is considered one of the most attractive courses in South Buckinghamshire. Kindly sponsored by Nexen Petroleum. A longish drive from the men's tee is required to carry light rough to the fairway. Trees encroaching from the left are the focal point and must be avoided to have any chance of reaching the green in two. Again the second is uphill and frequently under-clubbed. 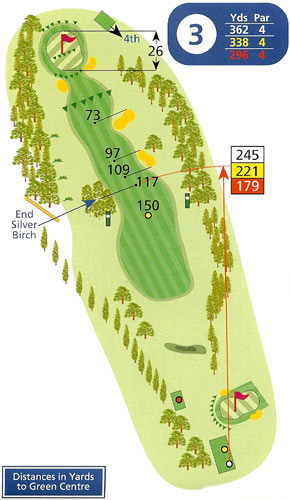 The two tier green is one of the more difficult surfaces if you leave yourself on the wrong level.